humans. Dr. Stephen Gundry explains that these defense strategies make the seemingly virtuous plants that we consume every day—fruits, vegetables, grains, nuts, and seeds—far less "good for us" than we assume. Plants may use physical deterrents (think: the spine-tipped leaves of an artichoke or the hard outer coating of a seed) as well as chemical warfare to repel predators. One of the most common forms of plants’ chemical defense system comes in the form of proteins called lectins. Found in the seeds, grains, skins, rinds, and leaves of most plants, lectins act as smart bombs in the human body, causing toxic or inflammatory reactions that lead to serious conditions such as leaky gut, autoimmune disease, chronic digestive disorders, heart disease, and weight gain. In The Plant Paradox, Dr. Gundry outlines the health hazards posed by lectins as well as the ways we can avoid them. The main sources of lectins in the American diet include conventionally-raised dairy products, beans, and other legumes, wheat and grains, and specific vegetables and fruits. The simple (and daunting) fact is, lectins are everywhere. But in The Plant Paradox, Dr. Gundry provides simple hacks we easily can employ to avoid this insidious plant toxin, including: Vegetables like tomatoes and peppers are full of lectins—but most are contained in the skin and seeds. Simply peeling and de-seeding your favorite veggies makes them safer to consume. Plants want us to eat them when they’re ripe to disperse their seeds! Eating fruit at the peak of ripeness—that means fresh, local, and seasonal—ensure that you will consume fewer lectins. Think "whole grains" are healthy? Think again. All of those grains and seeds with hard outer coatings are designed by nature to cause digestive distress—and are full of lectins. In fact, wheat contains one very famous lectin: gluten. 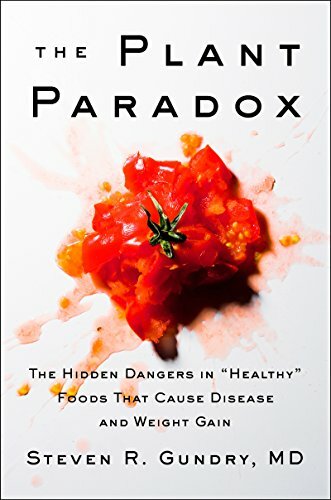 With a full list of lectin-containing foods and simple substitutes for each; a step-by-step detox and eating plan; and easy lectin-free recipes, The Plant Paradox illuminates the hidden dangers lurking in your salad bowl—and shows you how to eat whole foods in a whole new way. STEVEN R. GUNDRY, M.D., F.A.C.S., F.A.C.C., is the inventor of some of the most widely used heart-surgery devices and is renowned as an infant heart-transplant surgeon. Now, through his Center for Restorative Medicine, he helps patients avoid cardiac and other surgical procedures by using nutrition to reverse heart disease, diabetes, and arthritis. By bridging the gap between Dr. Atkins and Dr. Ornish and combining the best of the raw-foods and sugar-free plans, Dr. Gundry brings us to the next stage of diet evolution. From the Hardcover edition.